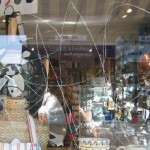 Graffiti scratches left by vandals on your shop glass windows are unpleasant and irritating. 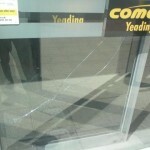 Ignoring graffiti scratches could damage the image of the retail business and may attract more damage. Our scratch removal kits polish and remove graffiti scratching with zero distortion, bringing the glass back to new condition at a fraction of the cost for a replacement. 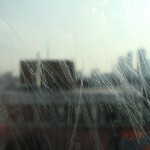 Graffiti scratching is caused by forcing a heavy object over the surface of the glass. We have a fully trained team of glass repair technicians who are able to repair all types of graffiti damage. You can purchase a professional kit and benefit from free technical phone support and detailed instructions, as well as step by step demo videos on YouTube. However, if you would prefer to hire us to do the job, click on Contact us or call the number above to speak with an expert. For commercial use with a glass polisher. Repairs all types of glass scratches. On-site scratch removal and polishing training courses.